Click to enlarge — it’s worth it! I’ve been greatly enjoying Dan Nadel’s Art Out of Time, Unknown Comics Visionaries, 1900-1969, a stupendous compilation of funnybook esoterica. Above we see an adventure of Hairbreadth Harry, a twenties newspaper strip. It’s nice to see that Winsor McCay’s GERTIE THE DINOSAUR was still remembered in 1924 (the nightmarishly expanding creature also recalls McCay’s Rarebit Fiend short THE PET). According to Rudi Blesh’s Buster Keaton biography, Gertie inspired the dinosaur scene in THE THREE AGES, with Keaton reasoning that animation and live-action could be combined in a way inspired by McCay’s short. This got me thinking about that dinosaur again — I’ve often wondered who made it. A Google search brought me a sample of Mark F. Berry’s indispensible-sounding The Dinosaur Filmography, published the same year as Nadel’s book, in which Lou Bunin (he of the peculiar ALICE IN WONDERLAND) named the great Charley Bowers as the artist responsible. This would make a lot of sense — Willis H. O’Brien is the only other Hollywood stop-motion man I can think of from this period, but if it was him we would know, wouldn’t we? — and would be Big News — a Bowers-Keaton collaboration! I hope it’s true, but we may never know. 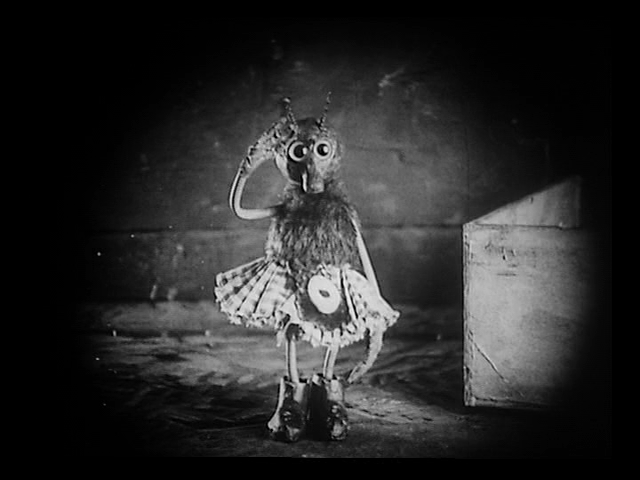 At Edinburgh’s late, lamented Lumiere (a terrible room with great programming), one of the treats was a screening of Keaton’s THE GENERAL, with THE GOAT (1921) in support. Apparently some kids had been dragged to see it by parents, and one of the pleasures was hearing a small boy say, after the short, “That was GOOD!” with a touch of amazement in his voice. They know their own minds from an early age, so this was a definite victory. I thought of THE GOAT again when looking for something to watch while we decided what to watch on our anniversary. Fiona hadn’t seen it, so far as she knew. The thing is, it has a great set-up and some great gags but isn’t the most scrupulously well thought-out Keaton short by a long chalk. But there’s a certain charm in the slapdash, or I hope there is, given that I’m at work on a script written in two weeks. 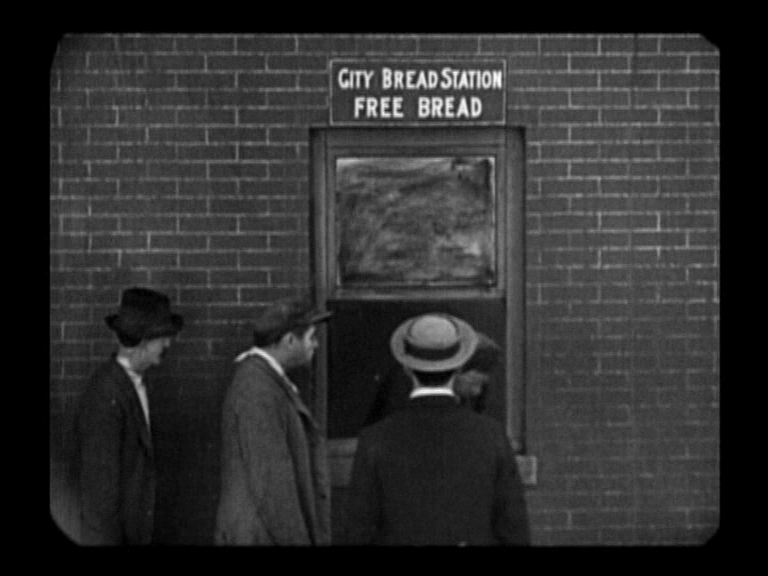 Buster is introduced in the bread-line, which gets some sympathy for him –Keaton always wanted to generate sympathy, “but you mustn’t ask for it.” This opening sequence really has nothing to do with anything, though. 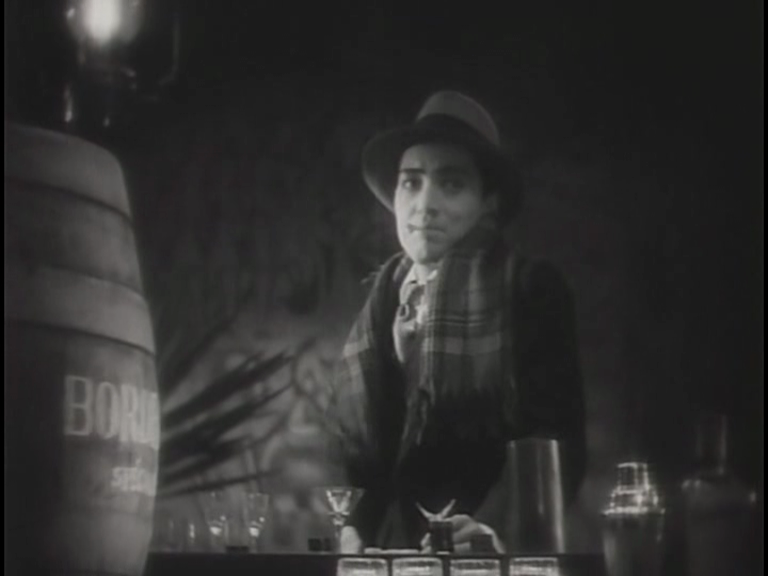 The movie could begin with the following bit, where Buster gets himself photographed in place of a murderer. There’s then a scuffle in which Buster knocks a heel unconscious and meets a girl (Virginia Fox, in one of her most undercharacterised roles). And then a mini-version of the chase in COPS with some very good gags, particularly the cunning way Buster locks his pursuers in a removals van, and the surprising way they turn up again later. Buster now escapes to the next town, which serves no great narrative purpose except to stop the cops chasing him, and have a passage of time. 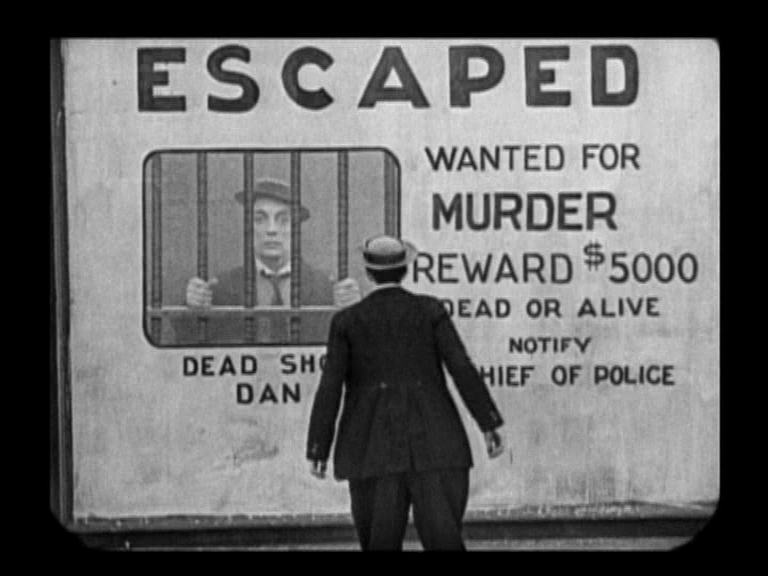 The wanted poster for the escaped murderer has now gone up, bearing Buster’s image, motivating another chase by cops, including town sheriff Big Joe Roberts, a Keaton favourite. My frame grabs seem to be emulating Beckett’s FILM. Keaton plays with the idea that Buster believes he must have killed that heel he knocked out — he plays with it for about one minute, then drops it, never to resolve the issue. 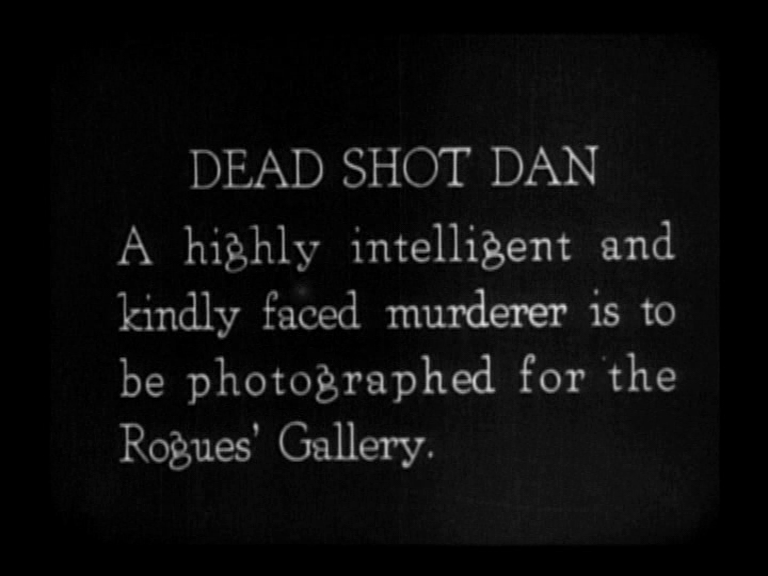 And Dead Shot Dan is never recaptured, a fairly major loose thread. Instead of neat resolutions we have even more brilliant gags. Fiona particularly liked Buster throwing himself out of a hospital, to land in front of an ambulance, whose stretcher-bearers calmly transport him back in — and the horse. 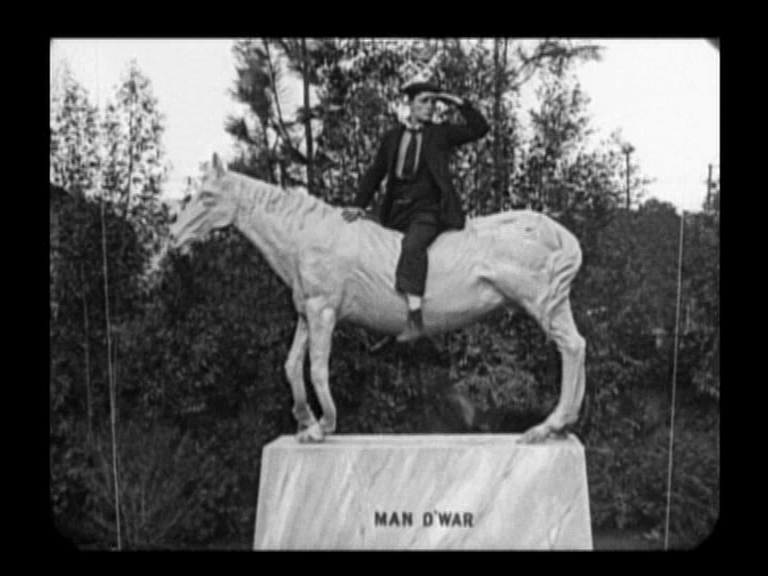 This one needs a special set-up via intertitle to even make sense — a sculptor is presenting the clay model of his masterpiece, which is to be presumably a bronze statue of a racehorse. The sheet is lifted to reveal Buster posed on the fake horse, hiding from cops. The horse slowly droops in the middle, legs buckling, eventually snapping off at hoof level as Buster and the sagging torso fall from their plinth, to the dismay of the sculptor. It’s somehow extremely funny in its grotesquerie, but it’s not the most elegant gag — the horse has to be suspended on wires and gently lowered to simulate its collapse. Keaton preferred not to fake anything, and if you could have made the shot work for real, it would certainly have been better. But it’s funny. Buster meets Virginia again, gets invited home to meet the folks, and pop turns out to be the sheriff. HUGELY prolonged suspense as Buster plays with the family dog, so that he doesn’t see Sheriff Joe and Sheriff Joe doesn’t see him. Then the family say grace, so everyone is looking down at their soup so they STILL don’t see each other. And then they do. Walter Kerr admired Keaton’s escape here. 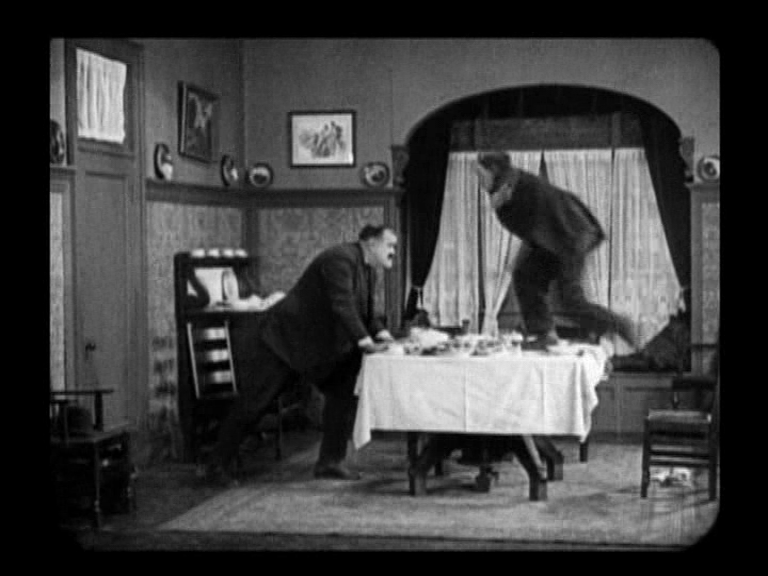 Sheriff Joe locks the door and bends the key, so Buster jumps onto the dinner table, onto Joe’s shoulder, and exits via a flying leap through the transom. Beautiful, logical, surprising, and only possible because all the important objects are arranged in a straight line across the screen in classic Wes Anderson formation. Lots of business with the elevator, climaxing with Sheriff Joe crashing through the ceiling in what appears to be an animated special effect — it looks like something Charley Bowers would do, and you know how stop-motion has a very distinct quality of movement? . That’s what I’m seeing here. And one recalls the dynamation dino in THE THREE AGES. But the elevator tips a lot of debris off its roof as it topples — could this be animated debris, as in EARTH VS. THE FLYING SAUCERS? It looks too dusty. 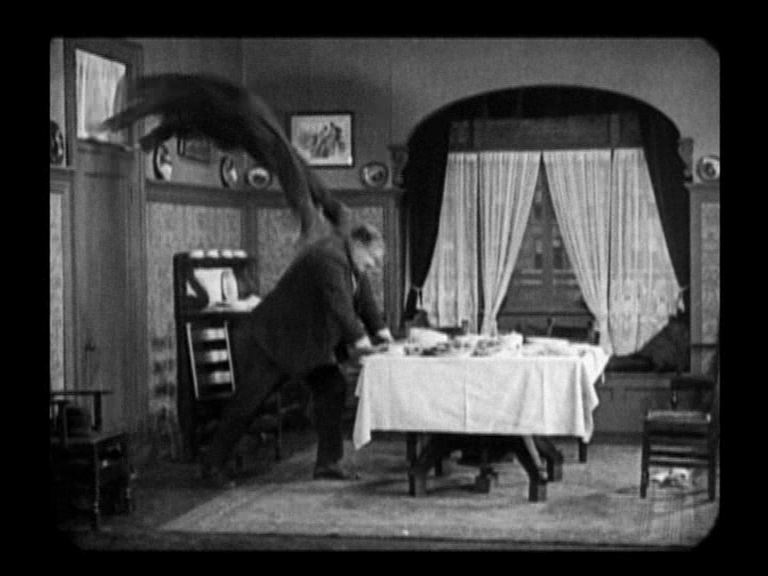 And no method existed in 1921 for combining an animated elevator with live action debris into a single shot. I’d love to hear the solution to this one. Anyhow, Buster exits with the girl, who is sublimely unconcerned that her beau just shot dad through the roof. And Buster is STILL wanted for murder.